The GMI declined to 1; the only positive indicator remaining is the WishingWealth Weekly QQQQ Index, which is still in a Stage 2 up-trend. But even the IBD Mutual Fund Index is now below its 50 day average, showing that the growth mutual funds are weakening. The QQQQ short term down-trend is now 3 days old (D-3). The last time the GMI was this low was August 31, at the end of a decline just before the big rally began in September. But the market has now rallied for seven months. 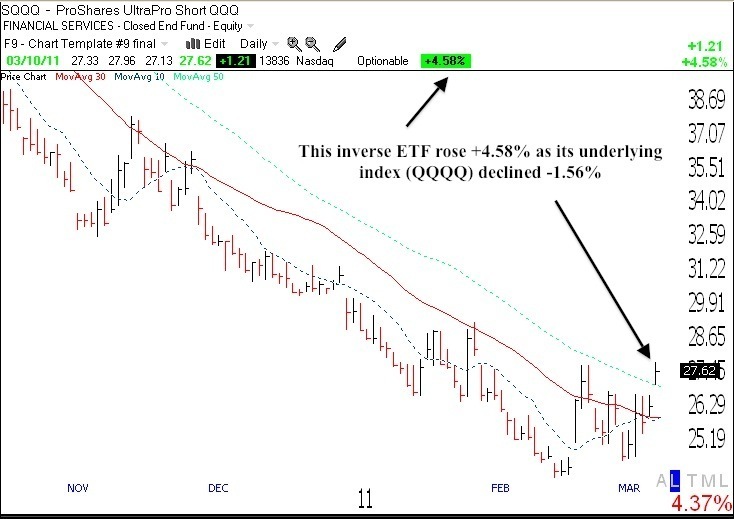 Inverse ETF’s rise as the relevant index declines. So, one no longer needs to short individual stocks when one can ride a decline by buying an inverse index ETF. Among the inverse index ETF’s and how they performed in Thursday’s decline are QID (+3%), SQQQ (+4.6%), SDS (+3.8%), DXD (+3.7%), DOG (+1.9%), SH (+1.9%) , PSQ (+1.6%). The reason some of these rose much more than others is because they are leveraged ultra short ETF’s designed to rise 2-3X more than their underlying index declines. Just keep in mind that the leveraged inverse ETF’s also fall more quickly when their relevant index rises. So, I therefore begin to slowly accumulate one of these inverse indexes when the short term trend turns down. It is also possible in uncertain times to hedge one’s long stock positions by buying one of these inverse ETF’s, in case the market should decline. Check out the inverse ETF’s by entering their symbol at the Yahoo finance site. what kind of market action would make you consider selling your pension funds? A Stan Weinstein Stage 4 decline. The major indexes fall below their 30 week averages and the 30 week average turns down. A top takes months to develop. I can transfer my university pension to cash very infrequently and must wait for clear signs of a major decline. I go to cash in my trading IRA much more quickly.